Making holiday cards with friends is for sure more fun than doing it alone at home. This NFT card project is meant to do with friends and better yet — to do it as a way to give back to the Internet community. First we talked to Diego, a full stack engineer and our co-founder from CryptoDecks. Then our friends Andy, James and David from KnownOrigin and Jon and Charles from SuperRare. They are all in. 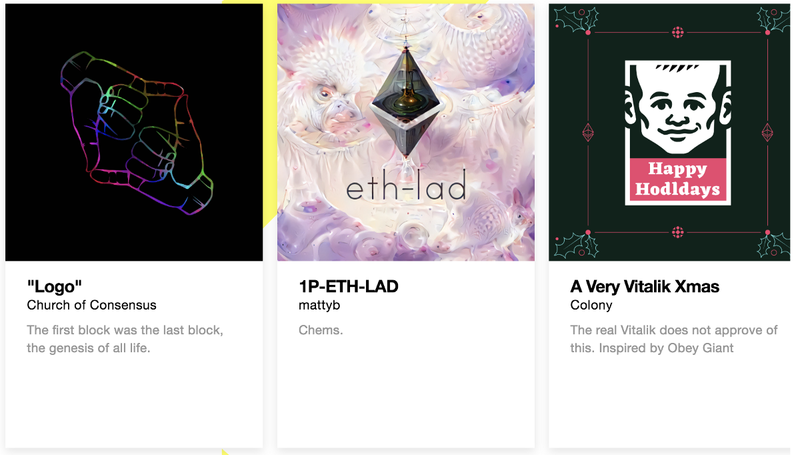 These two projects are the top of league when it comes to aesthetic on the blockchain. Perhaps our NFT card ideas are not that bad after all. More friends are joining force few days after. Daniel a stellar designer from Pheme, Matty from MetaCartel and Chris from Registree. Following the spirit of decentralization, our team consists of people from all over the globe from the UK, Thailand, Italy, South Africa and New Zealand. In addition, we’ve partnered up with many projects in the community: Ethberlin, 0xcert.org, blockcities.co, bounties.network, blockpunk.net, churchofconsensus.org, metacartel, opensea.io, colony.io, astroledger.org. Not to mention talented artists who donated their artwork to the project: 0xbull, Cristiana Vettor, XCOPY, uly128, Ophelia Fu, HEX0x6C, Stina Jones, Aktiv Protesk, Hugh D’Andrade, Hernan Wave, Stas Leontyev, laazeecat and Oficinas TK. Our plan is to work on this project on a pro-bono fashion and to give all income after deducting gas costs to the charities which have aligned values and goals with the Ethereum community. The Electronic Frontier Foundation (EFF) is on the top of our list. Earlier this year, I went to Devcon and had a chance to listen to one of the best talks in years. I first went in the room half asleep and got woken up by the guy on the stage talking about how “Code is speech” is recognized by the US government as a result of the winning case in the 9th circuit court and Appellate division. If they didn’t, encryption stronger than what a Raspberry Pi can handle would all be outlawed. This guy was in fact Cory Doctorow, whom I didn’t know back then that he was known among the cyber punk community. I got his name from Mamie from the Ethereum Foundation as I was asking for the name of the guy who talked about “Code is speech”. Cory was kind enough to later intro me to the Development Director of EFF, Aaron Jue, who gave us full support on our initiative.